Bare fibre has a breaking strength of 56 Newtons. 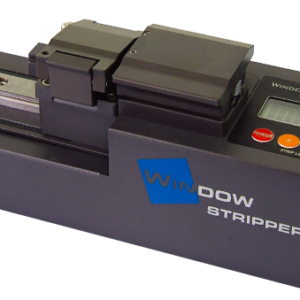 Auto Stripper is designed to strip various type of optical fibre using its heater plate which adjusts heating time and temperature. A motorised stage then drags the coated fibre across a blade which rips the coating off without touching the glass. Hand tools that mechanically strip the fibre often contact the glass and can weaken the fibre and lead to weak splices that will fail over time. The Autostripper removes this risk. It always gives you a stable operation, high quality of stripping and improves productivity with its auto motor and LM guide bearing. (Occurrence of ratio of cracks on fibre : 0%, giving high tension strength).